Automatic Data Processing, Inc. provides technology-based outsourcing solutions to employers, vehicle retailers, and manufacturers. It operates in three segments: Employer Services, Professional Employer Organization Services, and Dealer Services. This dividend aristocrat has raised dividends for 34 consecutive years. Back in November 2008 Automatic Data Processing announced a 13% dividend increase. Over the past decade this dividend growth stock has delivered an average total return of 0.50% annually. In 2007 ADP spun off its Brokerage Services business, distributing one share of Broadridge Financial (BR) common stock for every four shares of ADP common stock held by shareholders. The total returns calculation for ADP over the past decade includes this transaction. The company has managed to deliver an 8.00% average annual increase in its EPS between 1999 and 2008. 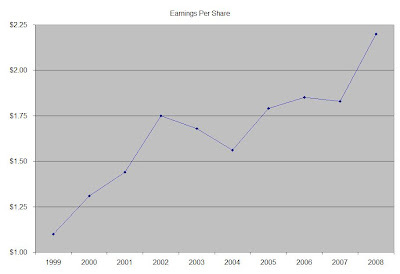 Analysts expect Automatic Data Processing to earn $2.38 share in FY 2009, followed by a small decline to $2.36/share in FY 2010. ADP’s earnings have been constrained by decrease in overall employment levels, closings at small and midsize businesses it services and a general decrease in interest income from funds held for clients. Never the less the company could achieve strong revenue growth of 5%-6% annually, as its markets such as HR management services and Business Process Outsourcing are expected to grow annually in the 5%-6% range over the next five years. The company is a leader in the processing space, and could achieve growth through acquisitions and expansion abroad. There is a high barrier to entry in order to compete in ADP’s business segments. I like the recurring revenue and long term deals structure that ADP’s business enjoys. This leads to stability in cash flow generation, which provides for a good foundation for solid dividend growth over time. 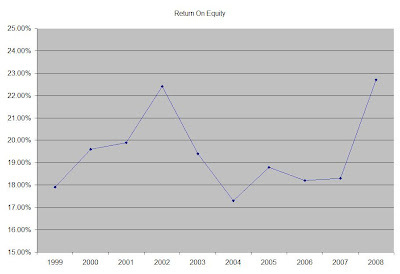 The Return on Equity has remained in a tight range between 17% and 23%. Rather than focus on absolute values for this indicator, I generally want to see at least a stable return on equity over time. Annual dividends have increased by an average of 15.50% annually since 1999, which is higher than the growth in EPS. The company has also managed to decrease the number of dillluted shares outstanding from 636 million in 1999 to 527 million in 2008 through share repurchases. A 15 % growth in dividends translates into the dividend payment doubling every five years. If we look at historical data, going as far back as 1979, Automatic Data Processing has really managed to double its dividend payment every five years. The dividend payout ratio has doubled to 50%. As the company matures, it has returned most of its earnings back to stockholders in the form of increased distributions and share buybacks. A lower payout is always a plus, since it leaves room for consistent dividend growth minimizing the impact of short-term fluctuations in earnings. Currently Automatic Data Processing is attractively valued at 16.00 times earnings, yields 3.40% and has an adequately covered dividend payment. In comparison to its closest competitor Paychex (PAYX), which trades at a P/E of 19 and yields 4.4% with a dividend payout ratio of 80%, I view ADP as more attractively valued. I would be looking forward to adding to my position in Automatic Data Processing (ADP) on dips.